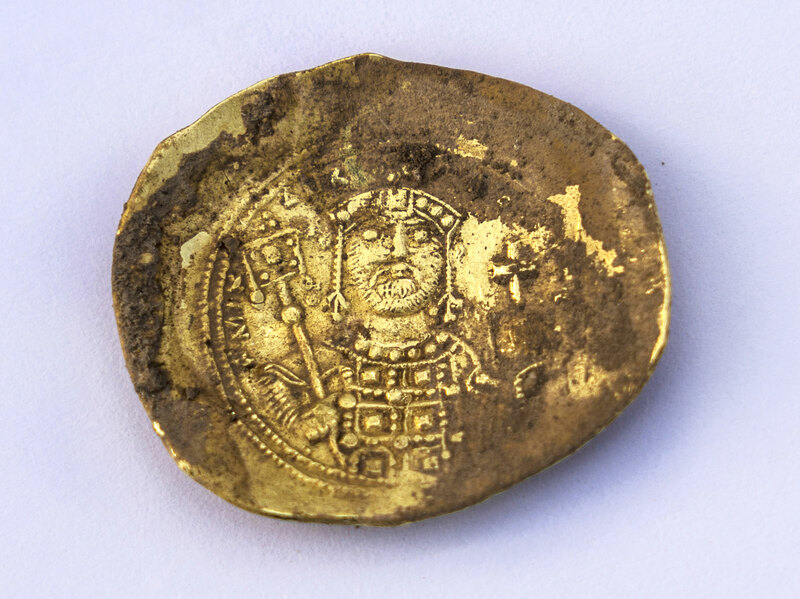 A rare gold coin from the late 3rd century discovered by a very lucky metal detectorist will be going up for auction in London in June with an pre-sale estimate of £70,000-100,000. 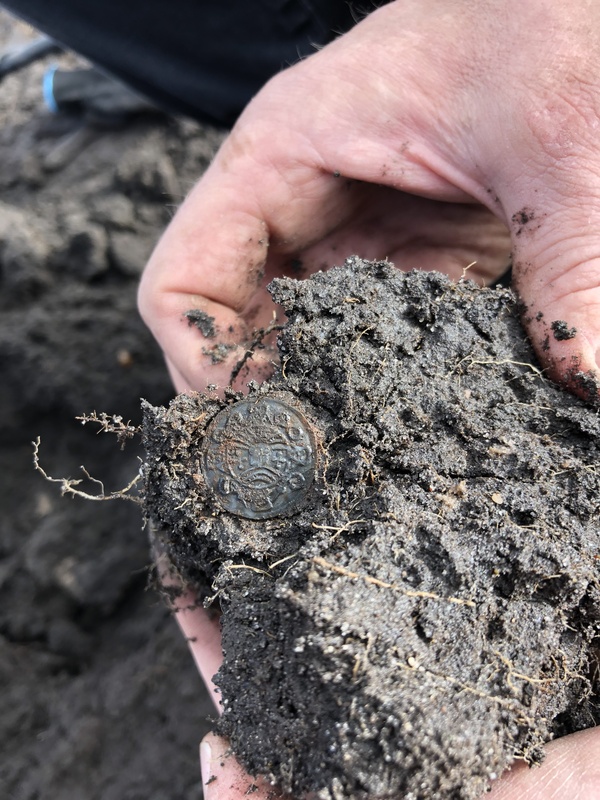 The 30-year-old finder was exploring a freshly-plowed field near Dover, Kent, when he found the coin. It was small, no bigger than a one-pence coin and weighed 4.31 grams (a teaspoon of butter weighs 5 grams). He thought it was a half sovereign at best, but when he sprayed away some of the soil, he saw the unmistakable shine of gold. The finder figured it was probably fake, but had it examined by numismatic expert Dr Sam Moorhead at the British Museum. 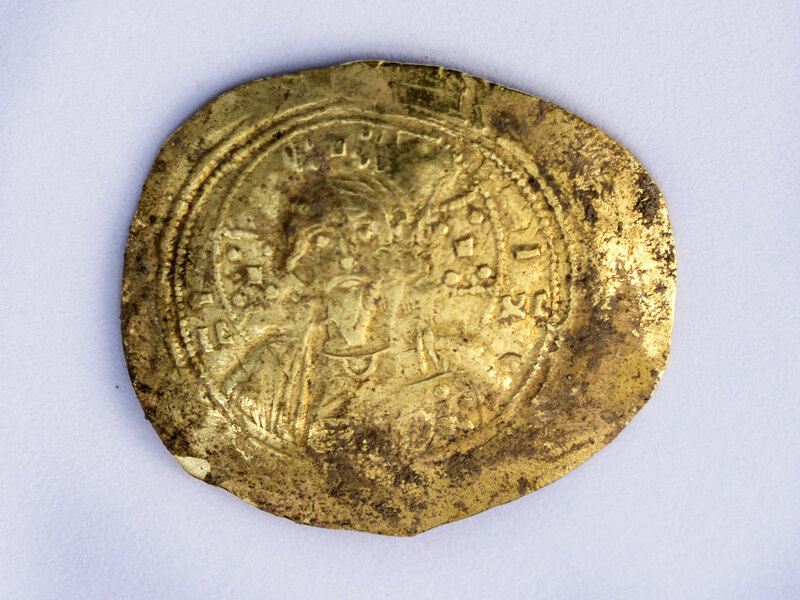 He identified it as an authentic Allectus aureus dating from 293-296 A.D., when the usurper emperor Allectus ruled in Britain. The British Museum has the only other exact match to it, discovered in Silchester, the city where Allectus died in battle against the forces of Emperor Constantius, in the 19th century. On the obverse is a bust of Allectus facing right, bearing the laurel wreath. 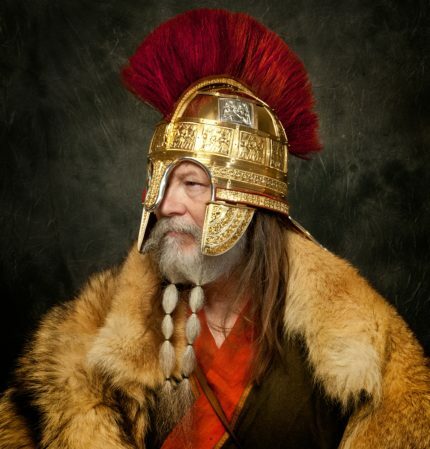 He wears a drape of fabric and a cuirass. 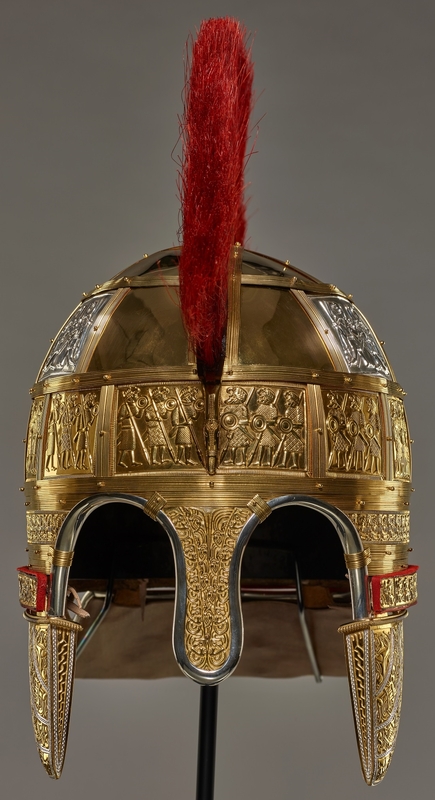 It is inscribed IMP C ALLECTVS P F AVG (Commander Allectus, Dutiful and Fortunate Emperor). The reverse has an image of Sol wearing the radiate crown, his right arm raised and holding a globe in his left. He is flanked by two captives on their knees. The inscription reads ORIENS AVG (rising of the emperor). The reverse also bears the mintmark ML, the signature of the Londinium mint. It is the second of its type found in Kent and is in excellent condition. Only a few small scrapes mar the original bright yellow gold surface. Despite its extreme rarity, precious metal content and unquestionable museum quality (what with it being twinsies to the one in the British Museum), because it is only a single coin, it does not qualify as official treasure under the 1996 Treasure Act. 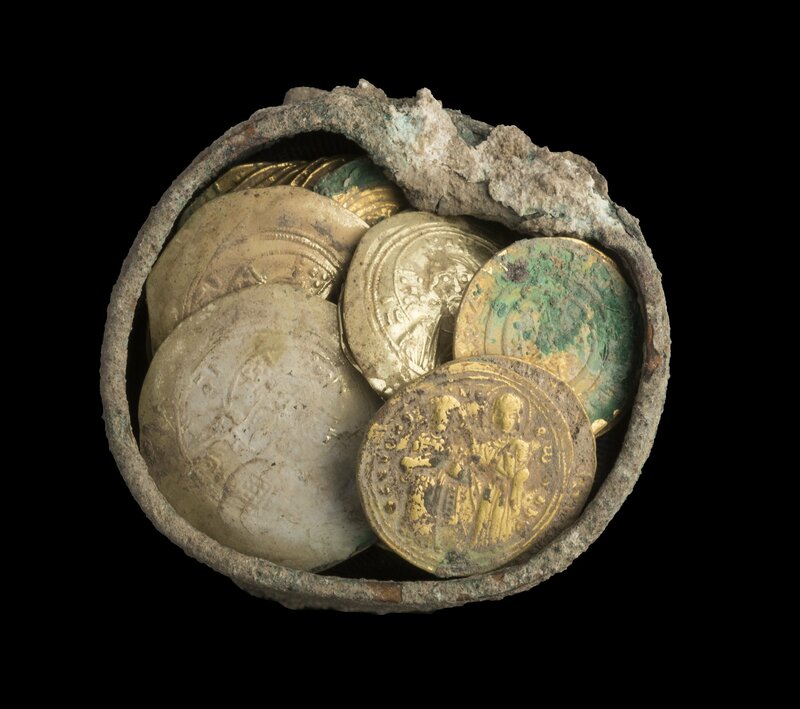 The current definition of treasure requires two or more coins. The coroner’s inquest was not triggered and finders keepers is the only rule that applies. This is one of the loopholes of the Act like the one that let the Crosby Garrett Helmet fall into anonymous private hands. Speaking of which, the UK’s Department for Digital, Culture, Media and Sport has announced planned revisions to the Treasure Act which would plug some of the holes. It would change the current sliding date standard (object 300 or more years old) to a fixed date of before 1714. Specifically addressing the Crosby Garret scenario, the proposed definition would cover anything that meets the age criterion with a value of over £10,000, regardless of material. 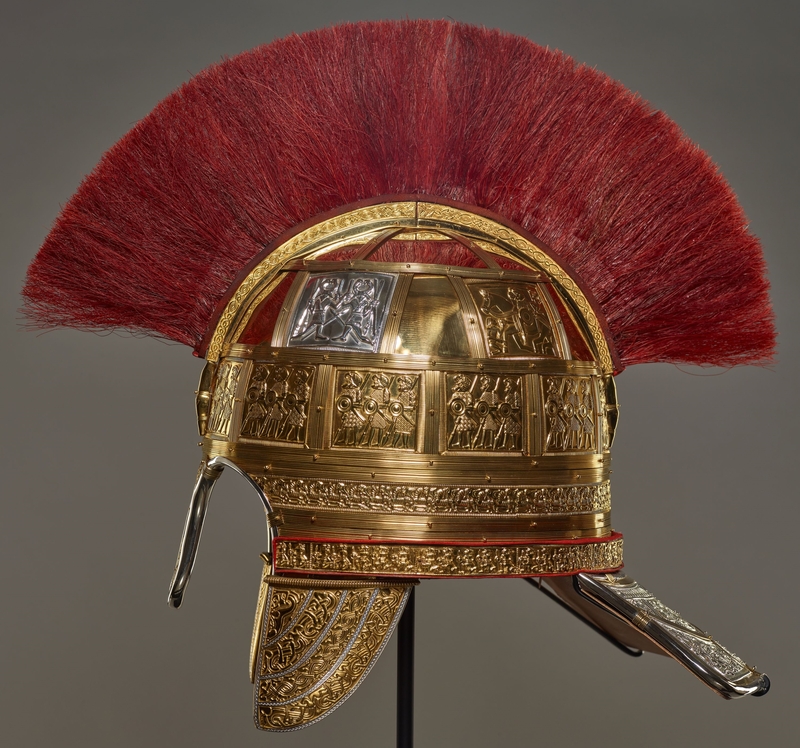 Had the helmet been silver or gold, it would have been declared treasure; it was bronze. Any Roman object, even one of base metal and with less than £10,000 market value would also fall under the definition of treasure. The revisions would include single coins dated between 43 A.D. (the dawn of the Roman period), and 1344, the year that Edward III re-introduced gold coins to English currency. The revised language is open to public consultation until April 30th. You can read the proposed revisions here (pdf), respond online here, or print a form and email/mail it to the Ministry. 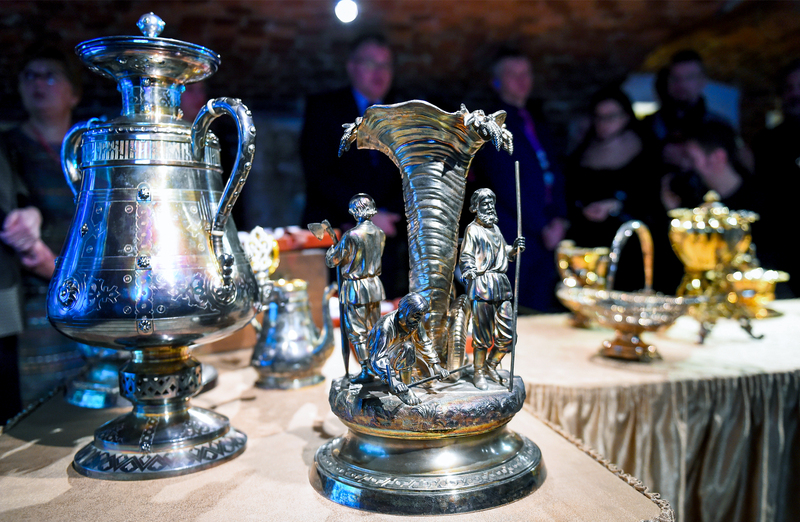 The massive collection of more than 2,000 pieces of silver secreted away in the walls of a Saint Petersburg palace and discovered during renovations in 2012 has gone on display for the first time at the Tsarskoye Selo palace museum in Pushkin. The Narshykin family had bought the palace in 1799 and lived there until 1917 when the fled the country and the Bolsheviks on the double. They left behind many valuable objects which were transferred State Hermitage Museum in 1920. But those were just the pieces that were easy to find. Before they left Russia with their portable wealth, the family carefully wrapped their antique silver and stashed it in a hidey hole between the second and third floors of the palace. It was so effective a hiding place that it wasn’t even found when the palace was extensively renovated in the 1960s. It took a three-year project of re-engineering and restoration that began in 2009 to break through a brick wall and reveal the secret room crammed with cases full of treasure. Apparently some of the crew tried to take a cut of the loot, hiding it away before the construction company alerted the authorities to the find, but they weren’t up to the job the Narshykin’s had done so thoroughly before them and the police found the pieces when they searched the building. The Naryshkin family was one of the most important in Tsarist Russia going back hundreds of years. It could trace its roots to the 15th century, but the family leapt to prominence when the beautiful Natalya Naryshkina (1651-1694) wed Tsar Alexis after his first wife died birthing their 13th child. Their son would become Peter the Great and she was rule as regent of Russia during his minority. Peter showered favor on his maternal family and the Naryshkin princes held high office in the government, military and court from then until the brutal end of the Russian monarchy. In July of 1918, Colonel Kiril Mihailovich Naryshkin, adjutant to White Russian Lieutenant General Sergey Nikolaevich Rozanov, was one of the first people to enter the Ipatiev House in Ekaterinburg. Rozanov and Naryshkin broke down the defensive palisade encircling the house and went in together. There were survivors left to rescue, only evidence of the slaughter that had taken place six days earlier when the guards, knowing White Russian forces were almost upon them, executed the Tsar, his family and loyal attendants. 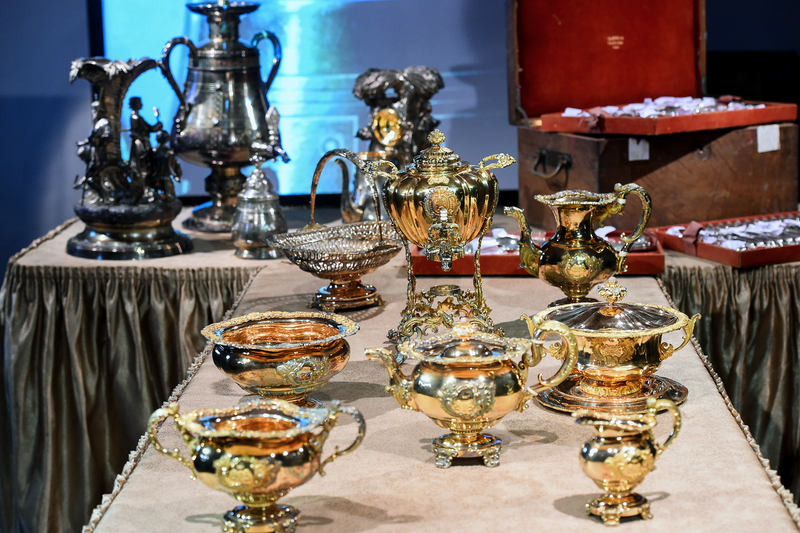 While there was some talk at the time the treasure was discovered that Narshykin descendants might make an ownership claim on the silver or of the finders getting 50% of its value, but surprising nobody the collection was declared historically significant and therefore property of the state. Since then it has been studied, inventoried and conserved and is now on public view in the Catherine Palace, the main building of the Tsarskoye Selo palace museum, which is also home to the reconstructed Amber Room. An Anglo-Saxon gold pendant discovered in 2017 has been officially declared Treasure by the Norfolk Coroner’s Office according to the provisions of the Treasure Act 1996. 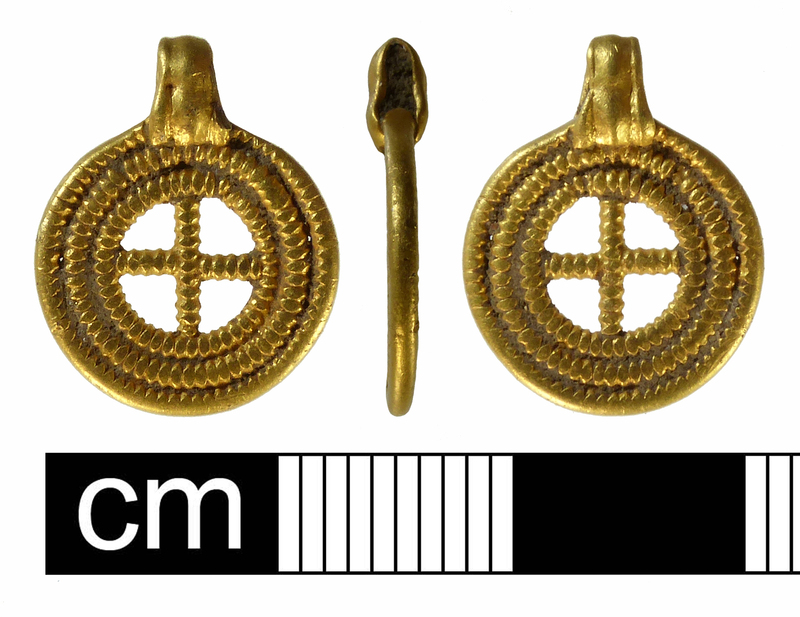 It was found in an undisclosed location in South Norfolk near the site where another important piece from around the same period, the Winfarthing Pendant, was unearthed in 2014. The pendant is in excellent condition. It is a small piece, .67 inches by half an inch, of a type known as a cross-in-ring pendant, a style that dates to the late 6th, mid-7th centuries. The ring part is composed of three concentric rings of gold beaded wire. In the center is a beaded wire cross. The outer rim is worn smooth, either from use or in the original crafting of the piece. A small sheet of gold is looped at the top middle. Traces of now-worn ribbed decoration remain. Ms Shoemark, from Norfolk County Council’s archaeology department, said: “Like the Winfarthing assemblage, this piece most likely belonged to a high-status lady. “It dates to an important turning point in Saxon history during the first flowering of Christianity [in England] and is of similar date to the jewellery assemblage from the now famous and nearby Winfarthing burial. “Male graves of this period appear to be entirely lacking in elaborate jewellery. The pendant will now be assessed by a valuation committee. Once its value has been determined, it will be offered to a local museum and the sum split between the finder and landowner. The Winfarthing Pendant was valued at £145,000, but it is much larger and inlaid with garnets reminiscent of some of the pieces in the Staffordshire Hoard. 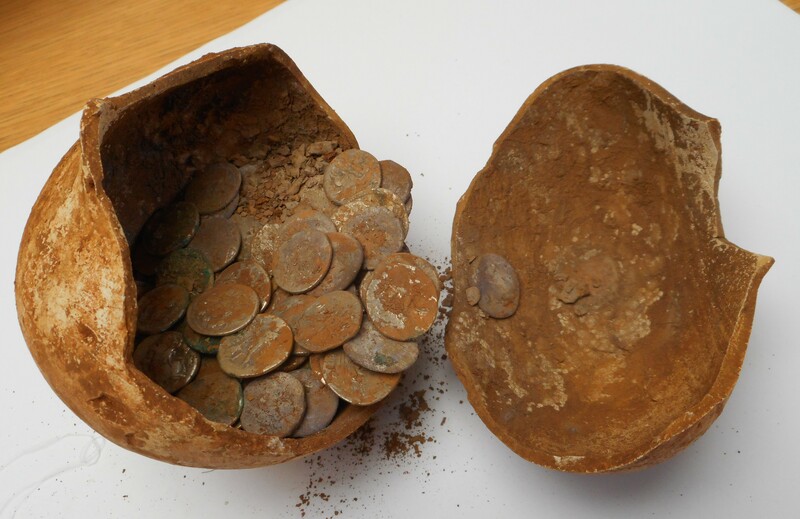 A hoard of Roman coins in a small clay pot has been found in South Warwickshire. 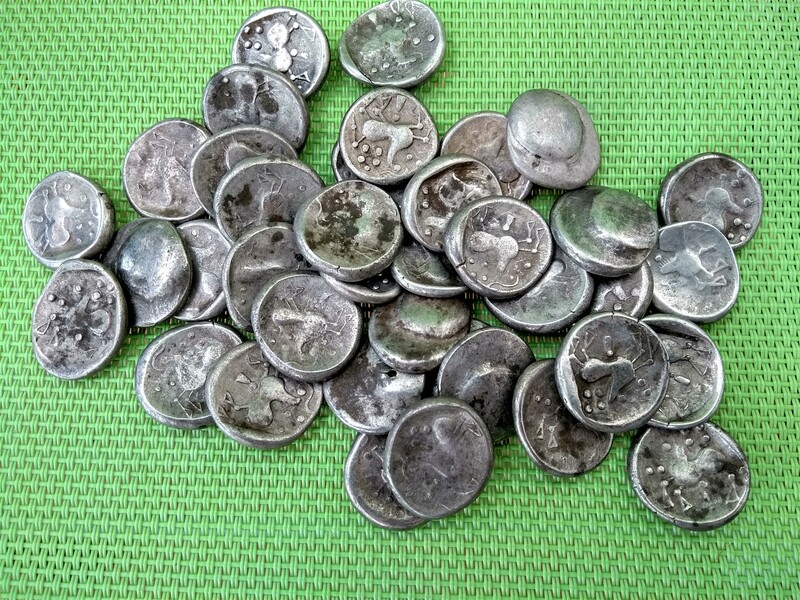 There are 78 coins in the collection, all silver denarii, in decent but not great condition. This is the second Roman coin hoard unearthed in Warwickshire since 2015. The first was larger, containing 440 silver denarii stashed in a large clay pot and buried in what is now Edge Hill, but what makes this one unique is that its coins date to 68-69 A.D., from the end of the reign of the Nero through the infamous Year of the Four Emperors. The overthrow of Nero and his consequent suicide threw the empire into chaos. Competing generals vied for the throne, and coup followed coup installing Galba, Otho and Vitellius successively as emperors for a few months apiece. The civil wars ended when Vespasian became emperor in July of 69 A.D. and founded the Flavian dynasty that would rule Rome for 27 years. Wars are expensive things and private armies don’t fight just for the principle. Galba found this out from day one, as he’d been acclaimed emperor by the Praetorian Guard who had been promised by their calculating leaders monetary reward for their support, something they had developed a taste for under the Julio-Claudians. But Galba had no intention of paying for the loyalty of his own guard, and with the imperial treasury in the doldrums, the coins he struck weren’t going to line the pockets of soldiers. Seven months later, Galba was a stabbed and decapitated corpse and Otho, who had bought 23 Praetorians to secure Galba’s fate, was emperor. 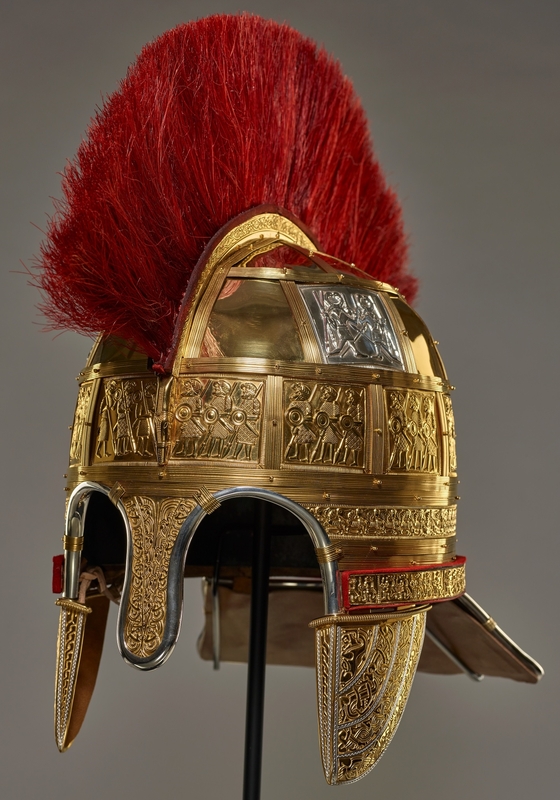 He couldn’t afford to buy the loyalty, even temporary, of the army of Germania Inferior, however, so three months later he was dead and Vitellius, commander of said army was emperor. He got to enjoy a whole eight months as emperor thanks to that support before he was defeated by Vespasian and the legions of the east. With this constant turmoil, competing armies, supremely self-interested parties looking to benefit from their selection of one or another candidate for the throne, the emperors made as much use as possible of their minting powers. Yet, surviving coins from this period are exceedingly rare in Britain. The 78 examples found in the clay pot are the largest single collection of coins from the Year of the Four Emperors ever discovered. 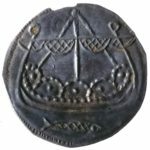 The hoard has been declared official Treasure and experts from the British Museum have assessed its market value at £62,000. 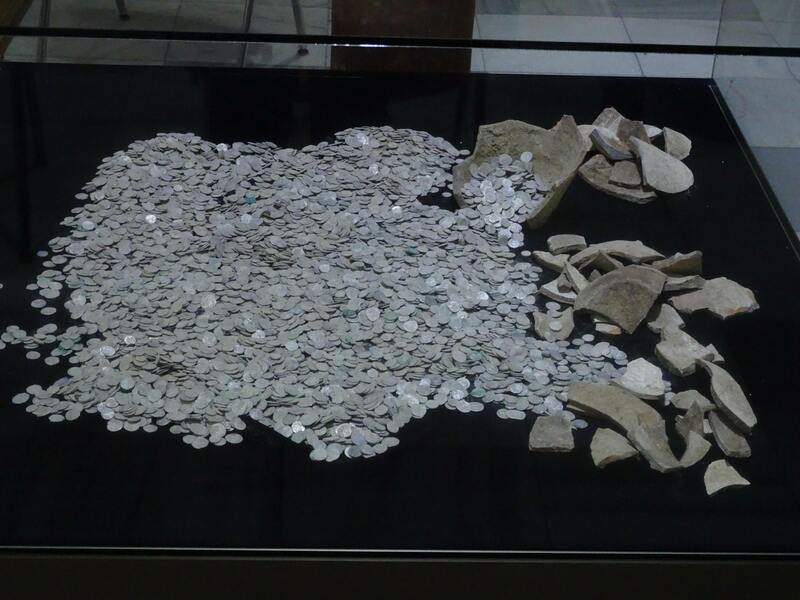 The local museum closest to the find site, Market Hall Museum in Warwick gets first crack at acquiring the hoard. It is applying for grants, throwing fundraising events and soliciting donations now. 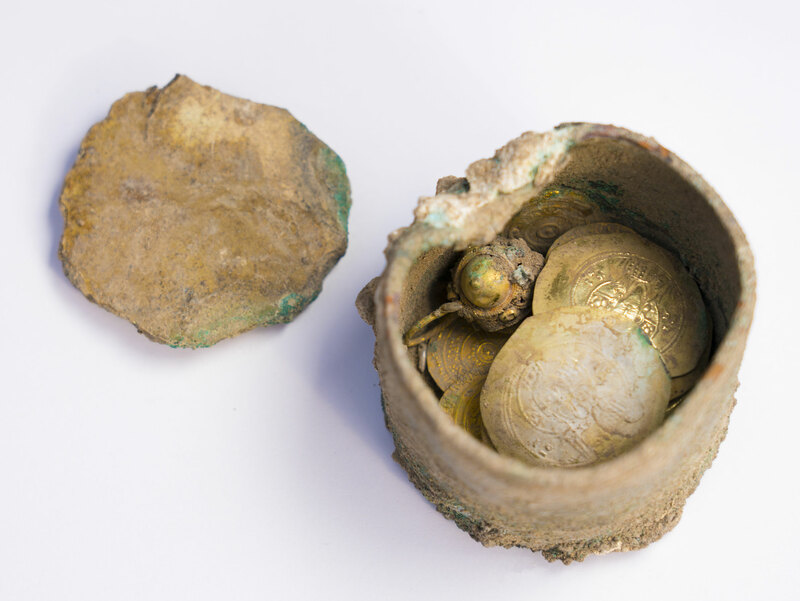 A gold bulla discovered by a metal detectorist in the Shropshire Marshes was one of the stars of the Portable Antiquities Annual Report unveiled at the British Museum on Tuesday. 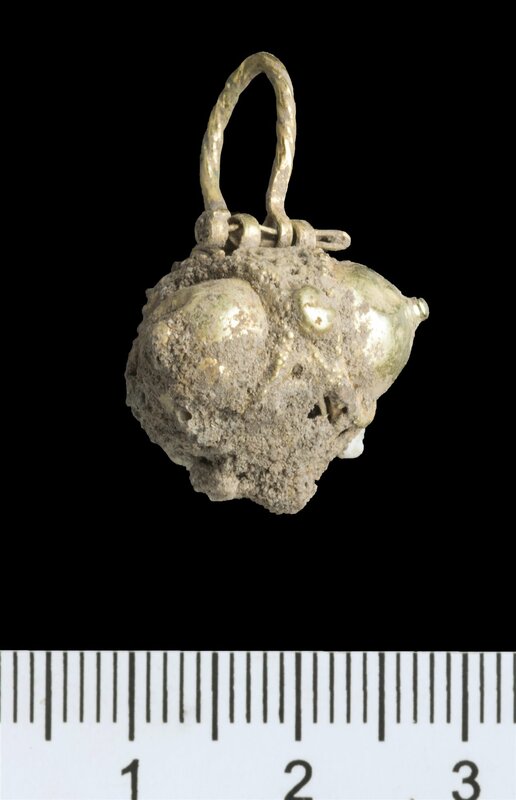 About 3,000 years old, it is the most south-westerly example of Bronze Age gold ever found in Britain and is one of only eight extant bullae found in Britain and Ireland. The only other bulla ever discovered in England was dredged from the Irwell ship canal in the 18th century, was sold for a couple of pounds and disappeared from the record. It is an exceptional piece. This kind of jewelry is known as a bulla after the Latin word for bubble because it’s hollow inside. 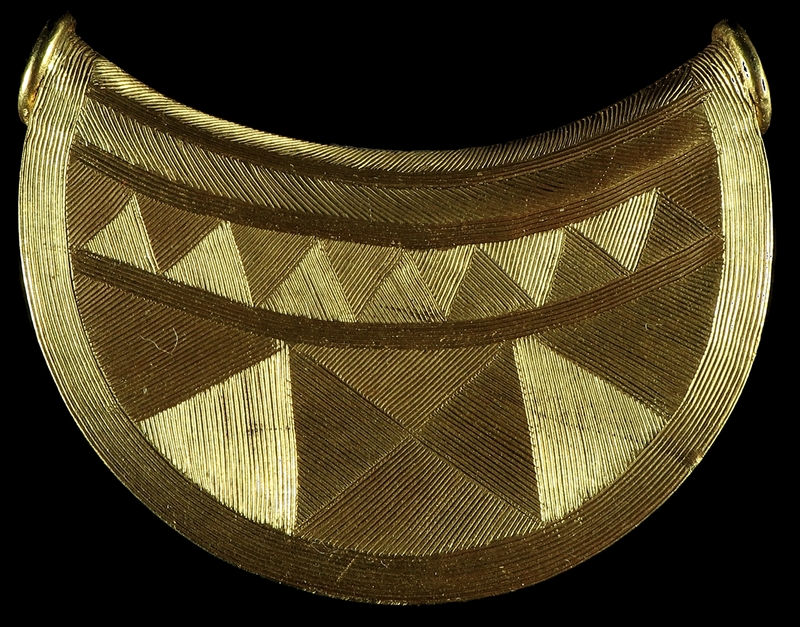 It is crescent-shaped with wedge-shaped sides and was created using at least two pieces of gold sheet. 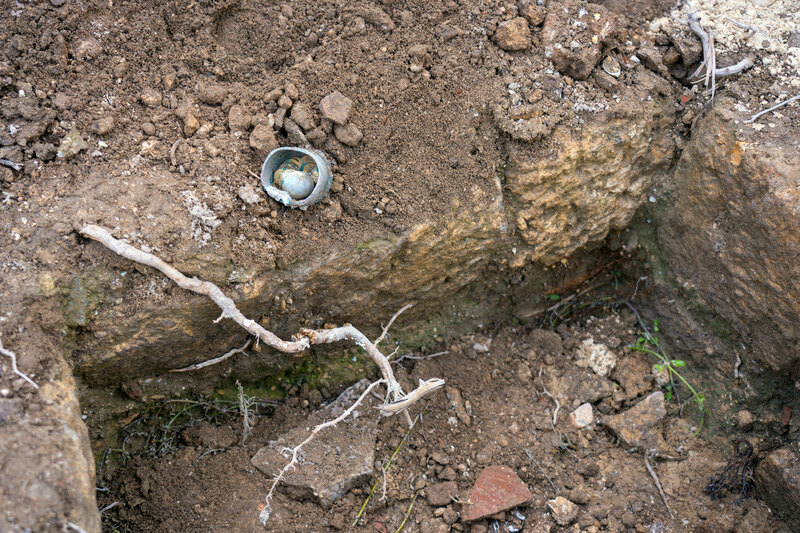 The top edge has collars on either side that were filled with clay or compacted soil, either deliberately or over the centuries it was buried. Between them is a tunnel which would have been used to thread a chain or necklace through to hang it as a pendant. The front and rear plates that make the body of the pendant are a single sheet of gold plate fixed at the mid-point of the top edge. A base plate closes the two sides of the plate. The fixing points are concealed so the plates and tube collar look like a single piece. The components were probably soldered together as the use of solder is well-established in metal objects from this period in Britain. The composition of the bulla was tested with XRF-analysis, but the presence of solder — which in Bronze Age objects is higher in copper or silver than the rest of the piece — could not be conclusively identified. The most striking element of the bulla is the decoration. Every surface is engraved with geometric designs filled with cut parallel lines and concentric curves. They are so precise, so even that the maker must have used a compass or divider to mark them out and then cut them using a graver with a 45 degree cutting edge. There are no punched or repousse patterns as have been found on other bullae. 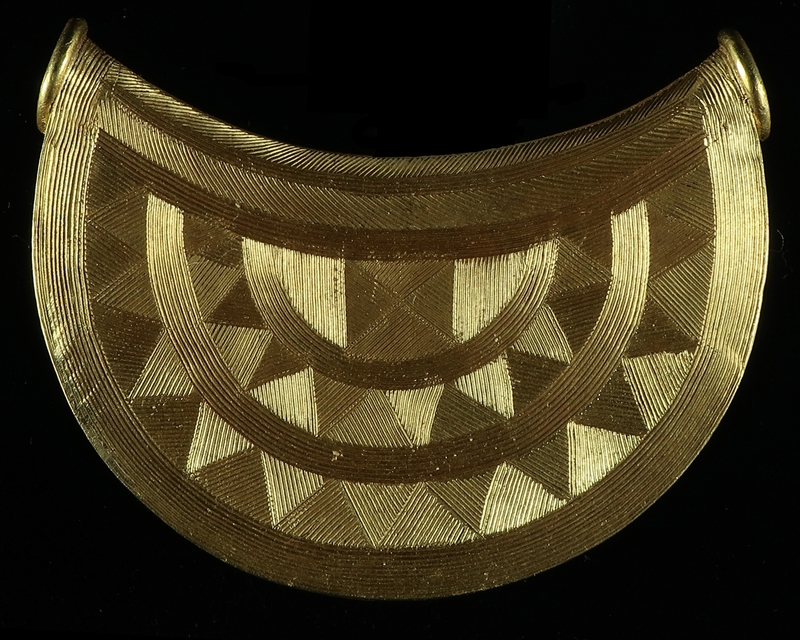 The deep grooves carved all over the piece suggest the gold sheet is comparatively thick and that the decoration was done on the completed pendant rather than on the sheets before they were put together. To top it off, the lines go in alternating horizontal, vertical, semi-circular and diagonal directions, creating a dynamic graphic look as well as an incredible play of light that makes the gold reflect in different shades that underscore the intricate shapes. This is work of the highest quality, the greatest possible workmanship, material and design that is all but incomparable in a British context. 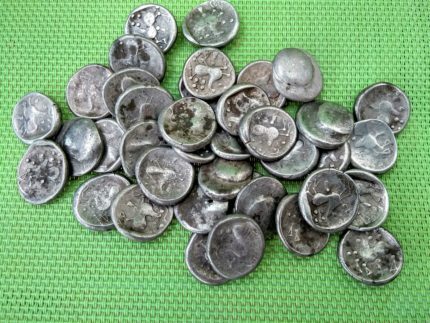 Inmates from Pleven Prison in northern Bulgaria have unearthed a large hoard of Ottoman silver coins. 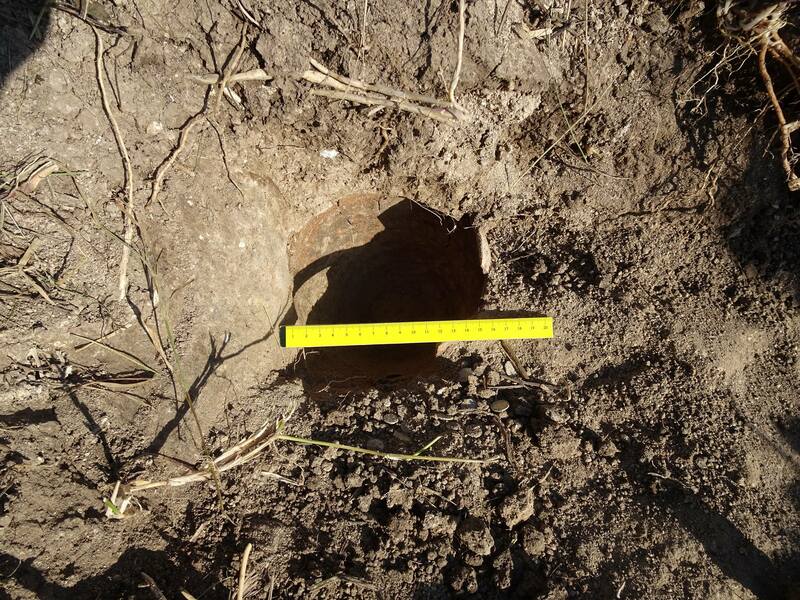 The inmates were doing agricultural work on prison grounds on November 9th when they accidentally dug up some coins about a foot under the surface. The coins were cached in two large pots and buried in the 19th century. There are 7,046 of them weighing a combined total of 18.4 pounds. They are all Ottoman Turkish akçes, the chief monetary unit of the Ottoman Empire from the 15th century until 1687 when they were replaced by the kuruş. After that, the gradual devaluation increased to Weimar-like levels. By the time they were buried, an akçe contained a meager 0.048 grams of silver, a steep plummet from their original .85 gram content. 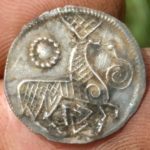 “They are from different coin issues, and of different face value, and they were probably collected over many years,” says archaeologist Vladimir Naydenov, as cited by the press service of Pleven Municipality. “It is curious that at the time, this amount of money could buy three houses in Odrin [Edirne] (a former capital of the Ottoman Empire, and a major city in today’s European Turkey – editor’s note),” he adds. “The 19th century is actually not that well known that is why the treasure is valuable as a source of historical information,” the archaeologist notes. The experts from the Pleven Museum of History hypothesize that larger Ottoman coins might have also been buried where the hoard from the treasure pot was discovered. Yet, for the time being no more coins have been found at the spot. 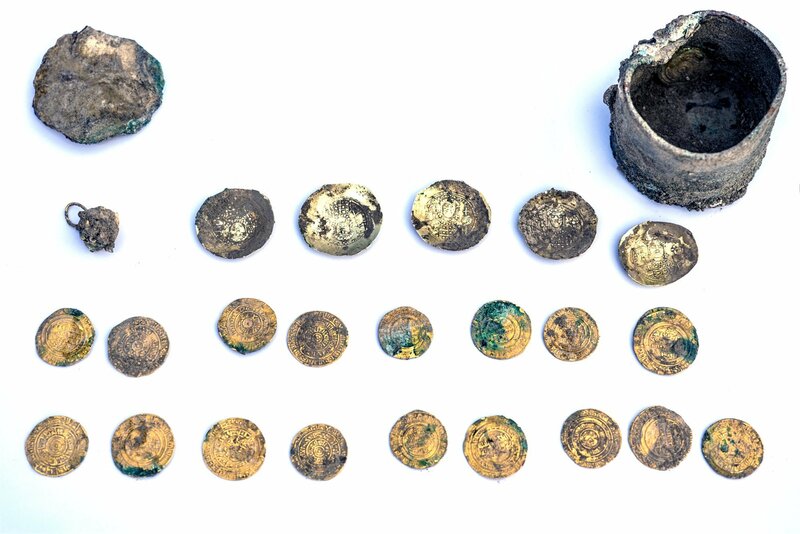 This is the third time pots full of treasure have been unearthed in Bulgaria in this year alone. One was of 18th century coins, the other of Tartar loot from around 1400. Their coin counts were far lower but they also included jewelry. 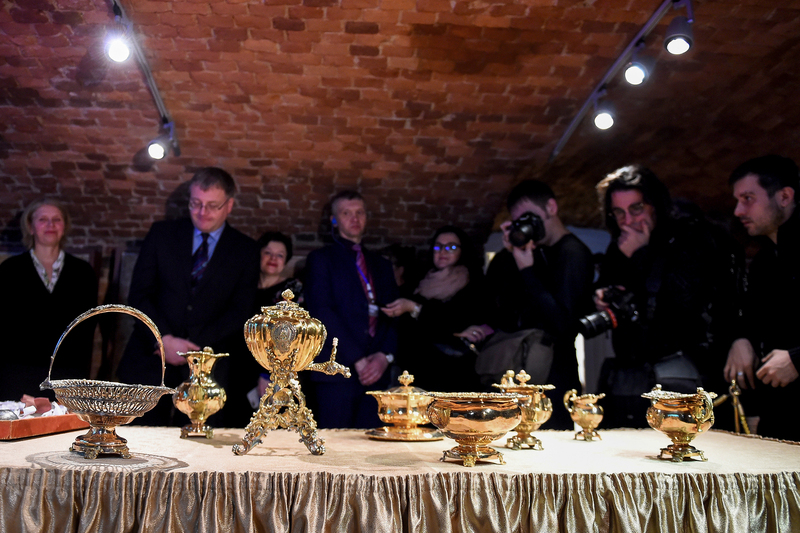 The coins and pots are now at the Pleven Regional Museum of History where they will be thoroughly cleaned, conserved and restored. 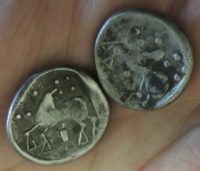 Numismatists will analyze them to identify with as much precision possible the date and location they were minted. They also hope to discover more about when they buried and why. 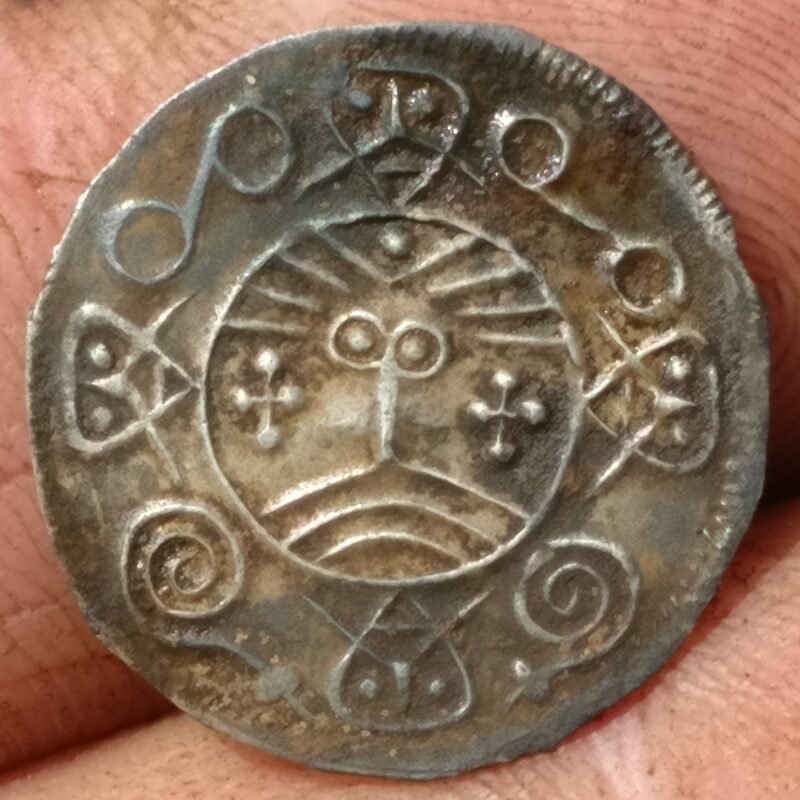 Archaeologists have discovered an exceptional group of more than 250 9th century coins in a bog near Ribe, Denmark. 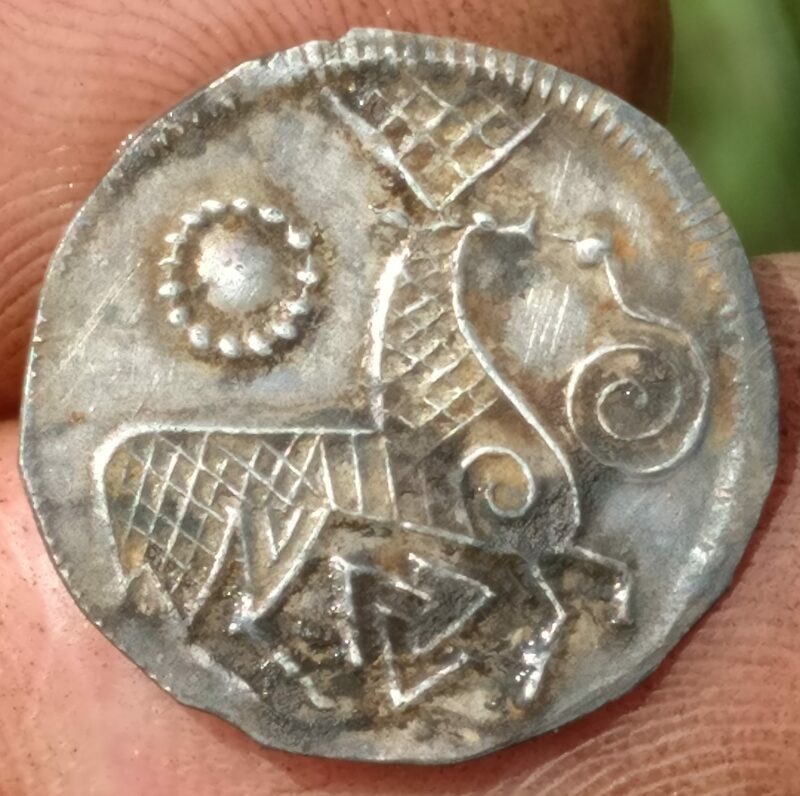 A metal detector hobbyist found the first coin earlier this year, an extremely rare piece known as a face/deer coin after the stylized face design on the obverse and the deer going nose-to-nose with a snake on the reverse. 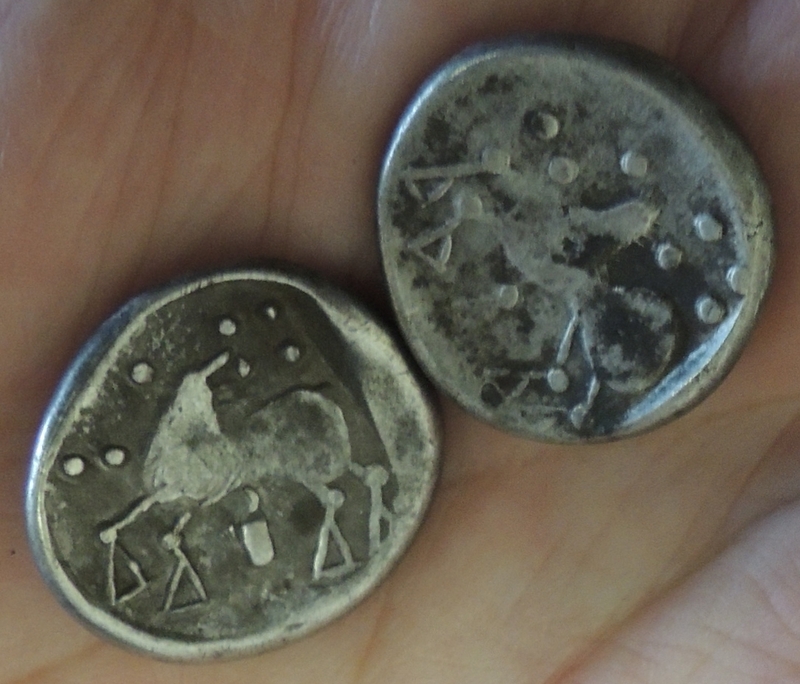 Only 11 face/deer coins were known to exist before this summer. The Museum of Southwest Jutland got wind of it on August 14th and contacted the finder the next day. That’s when they discovered there wasn’t just one more face/deer coin, but a whole bunch more, likely deposited in the wetland as a ritual sacrifice. With the help of the finder, museum archaeologists surveyed the site using metal detectors and precision GPS to document every discovery. Over two days, they found 174 coins, 172 of them face/deer coins, the last two with Viking ships adorned with shields on the obverse and deer on the reverse. 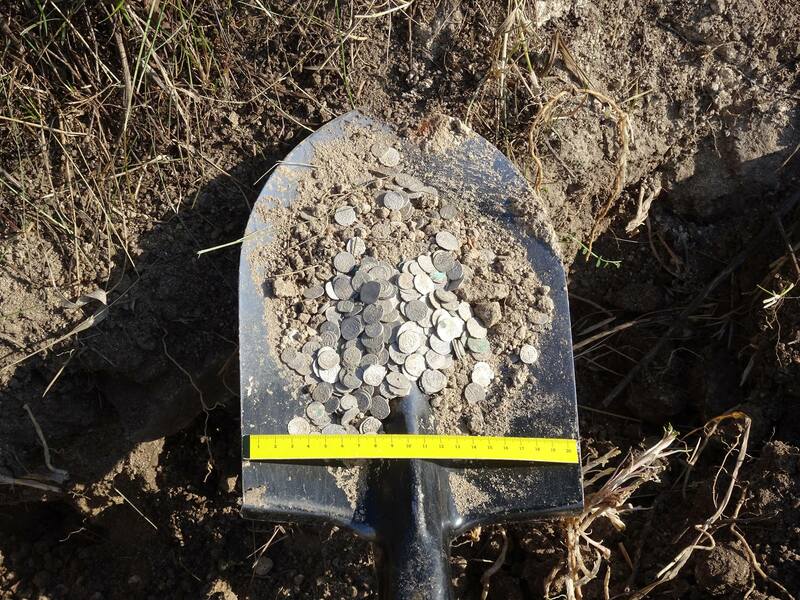 The coins were spread over an elongated oval about 165 by 50 feet in area, a distribution typical of coin deposits that have been scattered by repeated passes with plows. 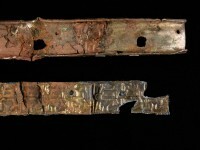 The way they were spread out suggests they were not buried in the bog, but rather placed on the ground in a single deposit, likely in a bag that was torn apart and destroyed over the centuries. The team returned to the site in late October to excavate it. This time they found another 78 coins, 77 face/deer, 1 ship/deer. The condition of all of the coins is excellent. They were in such great shape that many of them shone like new through the clods of peat when they were recovered by the archaeologists. “This is an exceptional find that means a quantum leap in our understanding of minting. 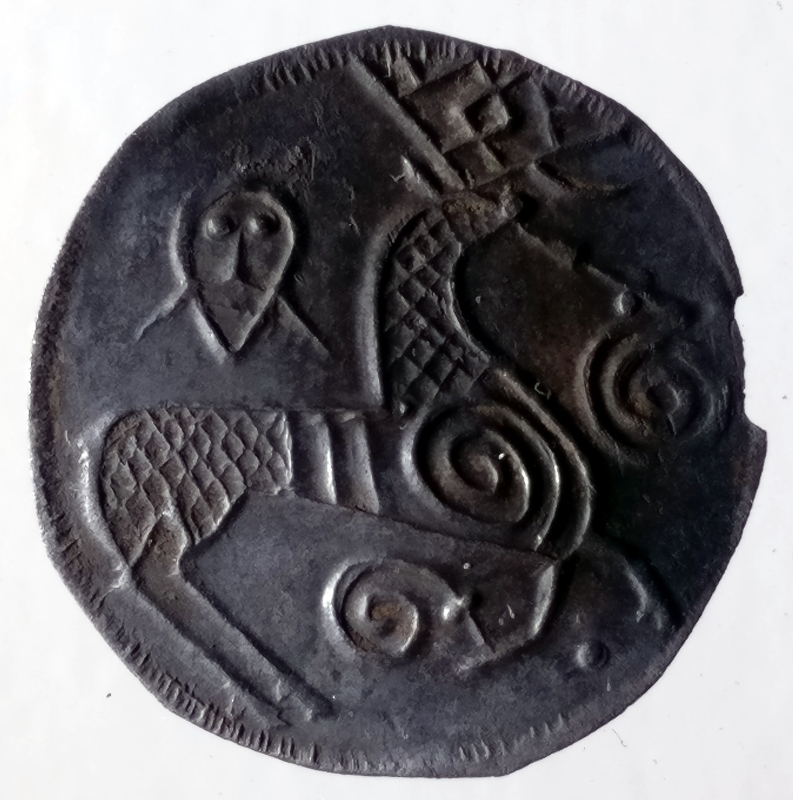 They are Danish coins and clearly minted for the purpose of being implemented in Ribe,” [Museum of Southwest Jutland’s Claus] Feveile told DR Nyheder. With no loops, perforations or clippings, it’s clear the coins were part of a money economy before their ritual deposition. The question of how much of a real monetary economy early Viking cities employed as opposed to a precious metal weight economy is a fraught one in the scholarship, and finding so many coins deposited in one place and preserved in perfect condition will give numismatic experts the unique opportunity to determine how many of these coins were minted and circulated. Initial examinations have already revealed that many different stamps were used to strike the coins, indicating a significant output that was in no way imaginable based solely on the two handfuls of coins known before this summer. When these coins were struck in the first half of the 9th century, Gudfred and later his sons ruled as kings of the Danes. Gudfred is the first Danish king we have decently reliable evidence of in contemporary chronicles. He fought against Charlemagne and the Franks. His son Horik I (the only son whose name is recorded but not the only one to rule) carried on his father’s legacy by raiding the Carolingian Empire of Charlemagne’s son Louis the Pious. We know little about Gudfred and his sons’ monetary policies or really much of anything about their reigns beyond their interactions with the Franks. The hoard may shed a whole new light on an obscure historical period. The coins unearthed thus far were briefly on display at the Museum of Southwest Jutland for a week until November 4th before being removed for further study. The excavation at the find site continued through October 25th. Between August and now, a total of 252 coins have been recovered. Archaeologists don’t think there are many, or even any, left to find.